For sale as it’s just a bit snug for me is my new, with tags Ducati Scrambler Urban RAID jacket. This is a mesh jacket made by Spidi for Ducati. Great summer jacket with pockets on front, a pouch in the back and small pocket on sleeve. There is armour to shoulders and elbows plus a space for armour in the back. I’m a 46 or 56 in Dainese and Rukka and it fits but just a bit snug around the middle for me. Message if you need to know anything else. I purchased this from Riders in Bristol for £150 a couple of weeks ago and haven’t worn it out, only tried it on. 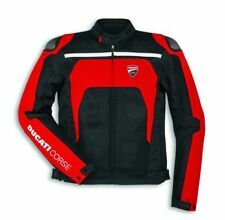 Ducati Corse Soft Shell Jacket Xxl 42/44 Stunning piece of kit. This jacket is a size xxl but is a small fit. I am 42/44 chest and fits really nice. I have only worn this jacket a couple of times as it was a Xmas present. My wife bought this jacket from Ducati Aylesbury and is an official jacket. 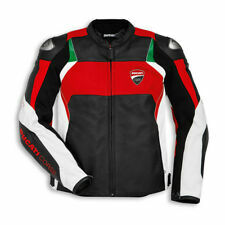 This is a stunning jacket for anyone owning a Ducati and also a very smart casual jacket. So grab a great bargain . These jackets cost around £125 at dealerships . Uk postage only. Thanks for looking and good luck. Ducati Leather Motorcycle Trousers Size 40"
Ducati Leather Motorcycle Trousers Size 40". Condition is Used. All zips working. No rips or tears. Weight loss forces sale Dispatched with Royal Mail 2nd Class. Ducati Motorbike Jacket Size EU 48. Condition is Used but is in fantastic condition and there are no visible signs of wear. Inside:Triple-layered fleece liner, Hydratex® | Z liner with mcFit® technology (waterproof 5.000 mm H2O; breathability 5.000 g/m2/24hrs). Outside:Goatskin, Suede leather with water resistant finish, PWR|shell 500D stretch, PWR|shell 500D with water-repellent, oil-repellent and stain-resistant coating. Cost new £535. D-skin leather abrasion and tear resistance. NanoFeel liner with inserts in 3D bubble air spaces fabric. Elasticated inserts. A full length waist zipper pairs with any of the sport styled Ducati leather jackets, to make a complete outfit. For better comfort the Sport C2 leather trousers have generous S1 stretch panels in non impact zones and adjustable calf zippers. Cost new £210. The upper, made of microfiber, features an ergonomic cut and two large bellows (one on the front and one on the back) that ensure flexibility and comfort. 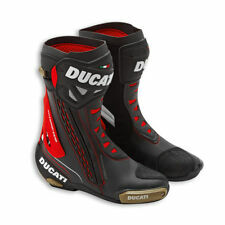 Ducati corse leathers by Dainese. Size 52. Back protector included. Collection in person only. FF 351-1 X tech design few marks here and there but nothing major. Produced in Softshell fabric, this windproof and highly breathable jacket is ideal for daily wear. 3 outer pockets Ducati Windproof Jacket 3. Tutu cowhide (thickness 1,2 /- 0,1 mm). 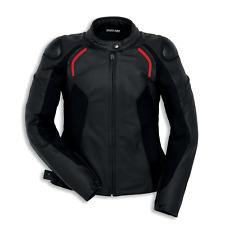 The full length pant to jacket zipper secures to any Ducati/Dainese riding jacket. Made by Dainese. Jackets to pants zipper. Tutu cowhide (thickness 1,2 /- 0,1 mm). 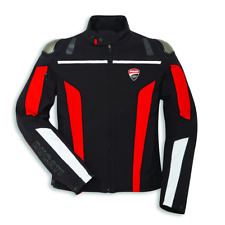 The full length pant to jacket zipper secures to any Ducati/Dainese riding jacket. Made by Dainese. Size Guide. Bell Ducati Scrambler Mach 2 Helmet size L. Condition is Used. Dispatched with Royal Mail 2nd Class. Only worn once but have now sold bike. It's as new RRP £250 Only 2 months old. Ducati Classic Dainese C2 Perforated Jacket. The style is completed with stitch elbow and shoulder patches over CE certified composite armor. A removable thermal liner makes this jacket comfortable for urban riding in almost any season - this is the perforated version. ".